This section provides information about library hours, employment, staff, library mission, events and policies. Welcome to the Gingrich Library. At Albright, we work to create an environment that encourages you to use our resources, facilities and talents so that you are successful in finding the information you need to be successful at Albright. Please take full advantage of the services and resources we offer. The Library staff works hard to provide these services in the most efficient manner possible. We encourage you to use the comments / feedback options on every page of this library website to provide any ideas for enhancement / improvement you have. 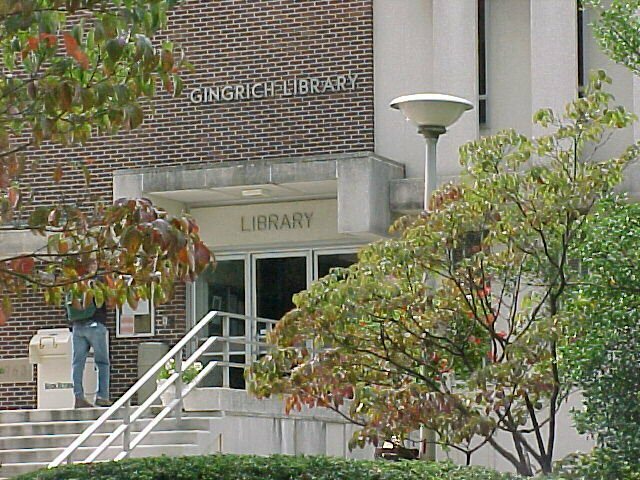 The Gingrich Library provides information, instruction and other services for the College community's teaching and research needs. Our collection provides the foundation for research and study on all disciplines taught at the College. The reference and general collections of more than 352,000 print and electronic books, print periodicals, microforms and audiovisual materials to support both the curriculum and general interests. Digital resources provide access to more than 100 different book, journal and newspaper databases and provide access to tens of thousands of online, full-text journals. A sample of these sources include BIOSIS, JSTOR, ScienceDirect, Academic Search Complete, Business Source Complete, SciFinder Scholar, eHRAF, MLA, Reading Eagle, Mergent, PsycINFO, PsycARTICLES and SOCIndex with Full Text. All students have complete access to the Gingrich Library catalog, electronic books, and all of its electronic databases from on-campus, in residence halls or off-campus. Students can request, free of charge, almost any book or article through our interlibrary loan system. Librarians are always ready to answer questions and help students find materials—in person, by email, text or phone. Student reference assistance is available 24/7 through the College’s participation in the AskHerePA services. The Library maintains a computer laboratory for instruction and training of students. The Holocaust Library and Resource Center collects Holocaust and genocide materials in various formats. The Special Collections Department includes rare and important local and historical materials as well as the College Archives, which preserves the institutional memory. The Curriculum Library and the Children's Book Collection support the College's education programs. The Library/Administration building was constructed in 1963 with a major addition in 1977 and a renovation planned for the near future. It can accommodate up to 250 library researchers at tables, individual study carrels and casual seating. In addition to a wireless network, the library maintains group study rooms and a lobby area which provides access to additional tables, chairs, vending machines. The Gingrich Library is a member of many library consortia and as a member of ACLCP, a consortium of more than 20 college and research libraries, the library can provide reciprocal borrowing and direct access to their millions of volumes. The Gingrich Library is an integral part of the academic experience. The staff gives highest priority to assisting students in their use of information and the library, so that the pattern of critically evaluating and researching information is instilled in all students. A copy of our Library Mission Statemenand Goals are available for review.